Product prices and availability are accurate as of 2019-03-31 19:48:58 BST and are subject to change. Any price and availability information displayed on http://www.amazon.co.uk/ at the time of purchase will apply to the purchase of this product. 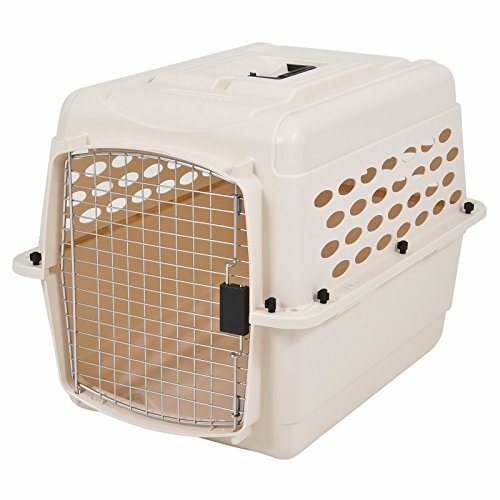 Petmate Vari Kennel Medium - in Cream Size: L28" x W20.5" x H21.5" or L71 x W52 x H54cm Suitable for Beagles, Staffordshire, Border Terriers, Miniature Poodles & Bichon Frise The Original plastic crate The Vari Kennel meets all airline requirements for worldwide pet travel and has a five year manufacturers warranty. Use this hard wearing plastic crate for transporting your Dogs, Cats and other pets abroad or travel in the car, can also be used a home crate as the vari kennel offers a true den experience. We believe the airline approved Sky Kennel to be one of the safest kennels for animal transport money can buy, they are recommended by experts all over the world. The Vari kennel safety features include unrivalled strong plastic shells, sturdy wire mesh door with lockable door. This is the original Petmate version of the Vari kennel with a a cream coloured top and base. Carry handle and strong, chrome finish door and moulded air vents. Air vents - fully IATA approved. Medium size for small to medium dogs/cats/pets. Lightweight, easy to assemble. Comes with metal bolts as required for IATA purposes. Quick and easy to use for car travel, crate training, plane travel with your pet(s). Call us on 0844 800 9907 or email us info@splendidpets.co.uk if you have any questions at all.